Drepung Lachi, Mundgod, Karnataka, India, 19 January 2013 — While the presenters from the Mind & Life Institute are meeting with His Holiness the Dalai Lama in the Drepung Lachi Temple, in the presence of about 900 monks, nuns, school students and invited foreign guests, another 5000 or so monks are gathered down the road in the Drepung Loseling assembly hall. 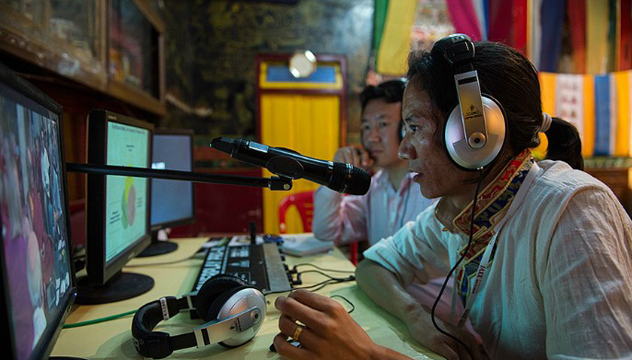 The presentations are largely being given in English and translated simultaneously into Tibetan, which those who need to are listening to on FM radios. There are plenty of video screens to provide a close view of the proceedings for those who cannot see them directly, as well as displaying the speakers’ accompanying visual presentations. Proceedings are being webcast live, attracting a steady audience of more than 1100 viewers. He quoted William James’s insight into attention. James suggested that when we see a tiger, the information goes up to the cortex, down to the viscera, the heartbeat increases, and fear arises after that, when the signal goes back to the brain. The brain detects that the body is agitated. His Holiness questioned this series of events because he has heard that along with fear blood rushes to the legs enabling us to run and along with anger blood rushes to the hands to enable us to fight. Richie Davidson explained that tests were done after eliminating the visceral pathway that showed that James was partly correct. After him James Papez was the first to identify the circuits in the brain associated with emotion. The classic view had been that emotional function was processed outside the cortex. Studies of men injured in the Second World War showed that those whose frontal lobes had been damaged also suffered emotional impairment. This demonstrated that the cortex, particularly the frontal cortex played a role in emotion. The modern understanding now is that the capacity to regulate emotions is in the frontal cortex. Richie reminded his audience of the experiment of offering 5-6 year old children a sweet with the proviso that they could eat it immediately, but if they could wait five minutes they would be given three sweets. Those able to exert restraint tended to grow into successful adults. His Holiness wondered if the experiment would as successful if, instead of offering a reward, the children were warned that they would be punished if they failed to wait. Richie declared that neuroplasticity is neither good nor bad, it’s neutral, but being exposed to positive influences, leads to positive change. His Holiness asked whether, despite this, neuroplasticity can be explained in terms of negative influence; it can. Three types of attention were mentioned: alerting, orienting and executive control, which were studied in connection with children undertaking vipassana meditative training over a period of 3 months. There was improved performance resulting in stiller minds and greater attention. Tania Singer reported on work running a training programme for the cultivation of compassion. She said that they have to identify what it is they want to test with regard to plasticity, because different processes have different circuitry in the brain. In the afternoon, Richie Davidson told His Holiness that he wanted to address a question he had asked about intelligence. His Holiness asked about trained intelligence and Richie replied that you can train someone in working memory tasks, remembering numbers and so on. He said that that is about memory rather than intelligence, but Christof pointed out that a quick memory is an accepted indicator of intelligence. Tania added that there are different words used: crystallized intelligence referring to memorization and fluid intelligence referring to coming up with ideas and putting them to use. His Holiness remarked that there do seem to be people who understand fast, but are not good at debate; others who get to the bottom of things; those who have swift intelligence, penetrating intelligence and so on. Richie explained that many human problems involve ‘emotional stickiness’. In experiments involving meditation on compassion, normal people with no previous meditative experience recovered from stickiness better. He concludes that some of the Western subjects were more anxious to begin with. On the other hand participants in mindfulness based stress reduction showed not only reduced stress, but also a smaller amygdala, the part of the brain associated with controlling the duration and intensity of negative emotion. He recalled an occasion in 1992 when he was talking with colleagues about neuroscience to a group of monks. They decided to give a demonstration of how they measured the brain activity of compassion. Francisco Varela was the guinea pig who was wired up with electrodes. When they stood back and the monks could see him, they burst out laughing. It turned out the laughter was not at how funny the monks thought Francisco looked, but at the idea that you could measure compassion by wiring up the head. Tania Singer talked about how we use cognitive processes when we talk about compassion and behaviour. Every cognitive process has a correspondence in the brain involving not only neurons, but also genes that produce neurons and neurotransmitters. She discussed three types of human motivational systems, the motivation that drives behaviour: a seeking or averting system; a threat system and a caring or affective system. She discussed the release of hormones like oxytocin that reduces amygdala activation and said that the question is — can focussing on compassion have the same effect? Her findings so far suggest that compassion training does bring about observable changes in brain networks and increases well-being. Geshe Dadul Namgyal completed the day’s very rich presentations with a Buddhist response touching on neuroscience and neuroplasticity, which he defined as the ability of the brain, neurons, circuits, etc., to form new structures and even functions. He began quietly as he reviewed the field, remarking that happiness is not something fixed that you either have or do not, it’s a skill, something we can learn. Looking at neuroplasticity from a Buddhist view point, he referred to the mind-body entanglement and suggested that it is karma that binds the mind and body together. Among other observations he mentioned a quotation he had found in a Buddhist text that listed eight bodily essences concluding with the startling remark that the brain is the essence of the mind. Instead of giving prime attention to the brain, he spoke of the mind as non-material luminous and knowing in nature. All consciousness events can be sensory or mental. Every event at a given time is composed of a mind and mental factors, basic awareness and secondary awareness. He illustrated this with vivid coloured diagrams depicting the main mind, not so much surrounded by as incorporating the five omnipresent mental factors, the factor of the event, be it compassion or hatred, and factors of virtue or non-virtue. He showed the complexity of what goes on in the mind with such determined enthusiasm that as he concluded, for the first time during this meeting, a wave of spontaneous applause swept through the audience. Geshe Dadul Namgyal is an exceptional scholar and practitioner with extraordinary English language skills in communicating the Dharma at all levels. He received his Geshe Lharam, the highest degree of learning in Tibetan Buddhism, from Drepung Loseling Monastery in 1993. In addition to serving as the Editor of Lhaksam Tsegpa, a journal produced by the Institute of Buddhist Dialectics, and Editor of Dreloma, a Drepung Loseling publication, he has also played a key role over the years as a convener, interpreter, and speaker for numerous conferences and forums exploring the interface of Buddhism with modern science, western philosophy and psychology, and other religious traditions, on both a national and international level. 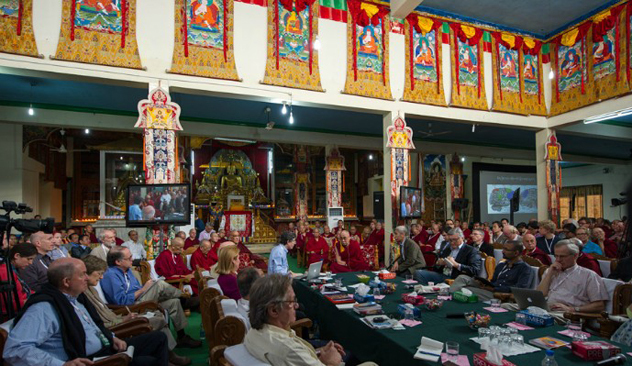 With this unique background and expertise in the interface between Buddhism and modern science, he will be an invaluable resource for the Emory-Tibet Science Initiative, which is developing a comprehensive science curriculum for Tibetan monks and nuns. Geshe Dadul-la also served for many years as the Principal of the Monastic School for Modern Education at Drepung Loseling Monastery, and then as a Professor of Indo-Tibetan Buddhism at the Central University of Tibetan Studies in Sarnath, India. In recent years, Geshe Dadul-la has served as the auxiliary English language translator for His Holiness the Dalai Lama and has traveled extensively in this capacity throughout the world. Монастырь Дрепунг Лачи, Мандгод, штат Карнатака, Индия. 19 января 2013 г. – В то время как докладчики из института «Ум и жизнь» встречаются с Его Святейшеством Далай-ламой в храме Дрепунг Лачи в присутствии примерно 900 монахов, монахинь, студентов и иностранных гостей, еще 5000 монахов собрались в большом зале монастыря Дрепунг Лоселинг. Презентации делаются в основном на английском языке с синхронным переводом на тибетский, который транслируется в FM-диапазоне. Повсюду установлены экраны, чтобы каждый мог следить за ходом дискуссии, а также смотреть презентации к докладам. Также ведется прямая трансляция конференции в Интернете, за которой следят около 1100 зрителей. Общей темой сегодняшнего обсуждения была нейронаука, а темой утренней встречи «Изменения в мозге». Вскоре после того как Его Святейшество прибыл в зал, поприветствовал лам и докладчиков и занял свое место, Ричард Дэвидсон, на протяжении более двадцати лет неизменный участник встреч, организуемых институтом «Ум и жизнь», начал свой доклад. «Созерцательная практика направлена на тренировку внимания и умения управлять эмоциями. Я буду говорить о соответствующих нейронных цепях и о воздействии, оказываемом на них тренировкой ума». Он сослался на выводы Уильяма Джеймса. Джеймс предположил, что когда человек видит тигра, информация передается в кору головного мозга, затем к внутренним органам, учащается сердцебиение, а затем, после того, как сигнал возвращается в мозг, появляется чувство страха. Мозг регистрирует, что тело находится в возбужденном состоянии. Здесь Его Святейшество задал уточняющий вопрос, так как он слышал, что чувство страха сопровождается притоком крови к ногам, чтобы мы могли убежать, а также к рукам, чтобы мы могли защищаться. Ричард Дэивдсон пояснил, что эксперименты, в которых был исключен вегетативный путь, показали, что Джеймс был отчасти прав в своих предположениях. Джеймс Папец стал первым после Уильяма Джеймса, кто выделил нейронные цепи в мозге, связанные с эмоциями. Согласно классическому представлению процессы, связанные с эмоциями, протекали вне коры головного мозга. Но исследования людей, получивших ранения во время Второй мировой войны, показали, что у раненых с повреждением лобных долей наблюдались и эмоциональные нарушения. Это свидетельствует о том, что кора головного мозга, в особенности лобная кора, играет роль в формировании эмоций. Современная точка зрения заключается в том, что лобная кора участвует в управлении эмоциями. Ричард Дэвидсон напомнил слушателям об эксперименте, в котором детям 5-6 лет предлагают конфету и говорят, что они могут съесть ее сразу или подождать пять минут, и тогда они получат три конфеты. Дети, которые смогли удержаться от соблазна съесть конфеты сразу, впоследствии выросли успешными взрослыми. «Из этого можно сделать важный вывод о том, что если бы мы могли научить детей дисциплине, пока они еще маленькие, то по мере их взросления это принесло бы пользу им самим и всему обществу». Его Святейшество поинтересовался, каким мог бы быть результат, если бы в эксперименте вместо вознаграждения детям пообещали наказание за то, что они не удержались от соблазна съесть конфету немедленно. Ричард Дэвидсон заявил, что нейропластичность ни хороша, ни плоха сама по себе, но если мы находимся под воздействием позитивного влияния, то это ведет к положительным изменениям. Тогда Его Святейшество спросил, можно ли объяснить нейропластичность в терминах негативного влияния. Ответ был, да. «Есть нейроны, которые срабатывают только в ответ на позитивные ситуации или даже на позитивных людей, а есть другие, которые “выстреливают” в негативных условиях». Были упомянуты три типа внимания: готовности, ориентировки и исполнительного контроля, которые изучались у детей, занимавшихся медитацией випассана на протяжении более трех месяцев. Результатом таких занятий стало улучшение внимания и более спокойный ум. Таня Сингер рассказала о программе тренировки, направленной на развитие сострадания. По ее словам, ученым надо определиться, что именно они хотят измерять в случае с пластичностью, поскольку разным процессам соответствуют разные цепи в мозге. «Если вы спросите меня, откуда мне известно, что вы чувствуете, то на этот вопрос можно ответить двумя путями. Первый, эмоциональный, с участием сопереживания и сострадания, а второй, через познание, опирающийся на знания, полученные путем логических умозаключений». Эмоциональный путь подразумевает такие чувства, как любящая доброта, благодарность, забота и теплота, в то время как путь через познание, который, по мнению Тани Сингер, более сообразуется с тем, что буддисты отнесли бы к категории воззрения, подразумевает участие памяти и метакогнитивные процессы, или ментальное осознавание того, что вы делаете. Она также сказала, что изучалась генетическая среда и особенности окружающей среды участников исследования. Можно четко связать разные части мозга с разными реакциями. Таня Сингер сказала: «Есть обширные данные, свидетельствующие о том, что наблюдение за эмоциями других активизирует в нашем мозге зоны, ответственные за соответствующие эмоции. Мы делали энцефалосцинтиграмму мозга Матье Рикара в реальном времени и во время этого исследования просили его входить в разные метнальные состояния, вызывать у себя разные типы сострадания, безобъектное сострадание, любящую доброту и сострадание. На графике я четко могла видеть, когда он испытывал сопереживание страданиям других, в то время как сострадание давало другой тип сигнала». Его Святейшество так прокомментировал это: «В сущности, если мы возьмем такие качества как сострадание, любящая доброта, то всегда мы стремимся к тому, чтобы они были наиболее действенными, а значит, в их основе должны лежать разум, понимание и положительная мотивация». Во второй половине дня Ричард Дэвидсон сказал Его Святейшеству, что хотел бы вернуться к ранее заданному вопросу об интеллекте. «В современной нейронауке господствует представление об интеллекте, как о величине, измеряемой в тесте на IQ (коэффициент умственного развития), в который входят шесть групп вербальных тестов и шесть групп невербальных тестов. То значение, которое вы вкладываете в понятие интеллекта, реакция на разные ситуации, гораздо богаче. Что касается нейронноей системы и интеллекта, то формирование лобных долей мозга в значительной степени обусловлено наследственными факторами». Его Святейшество спросил, можно ли тренировать интеллект, на что Ричард Дэвидсон ответил, что можно развивать память, запоминать числа и делать тому подобные упражнения. Но это будет тренировкой именно памяти, а не интеллекта. На что другой участник обсуждения заметил, что быстрая память общепризнанно считается показателем интеллекта. Таня Сингер добавила, что существуют разные термины: кристаллизованный интеллект, который относится к запоминанию и устойчивым знаниям, и подвижный интеллект, относящийся к способности высказывать новые идеи и применять их на практике. Его Святейшество заметил, что по его наблюдениям есть люди, которые быстро схватывают, но не слишком успешно выступают в диспутах; есть те, кто во всем стремятся добраться до самых глубин; есть люди с быстрым умом, проницательным умом и так далее. Ричард Дэвидсон пояснил, что многие проблемы людей связаны с так называемой эмоциональной ригидностью. В экспериментах с медитацией о сострадании обычные люди, не имевшие прежде опыта медитации, быстрее избавлялись от эмоциональной ригидности. Он отметил, что некоторые из западных испытуемых с самого начала испытывали гораздо большее беспокойство. С другой стороны, у участников программы снижения стресса при помощи развития осознанности не только снижались показатели стресса, но и уменьшался размер миндалевидного тела, части мозга, связанной с контролем продолжительности и интенсивности отрицательных эмоций. Он вспомнил, как однажды, в 1992 году, вместе с коллегами беседовал о нейронауке с группой монахов. Ученые решили показать монахам, как они измеряют активность мозга человека, испытывающего сострадание. Фарнциско Варела взял на себя роль подопытного животного. Когда ученые расступились, и взглядам монахов предстал Варела, опутанный проводами и утыканный электродами, то они не могли удержаться от смеха. Как выяснилось позже, монахи смеялись вовсе не над нелепым видом ученого, а над самой идеей о том, что сострадание можно измерить, опутав голову проводами. Таня Сингер говорила о том, как мы используем познавательные процессы, говоря о сострадании и поведении. Любой познавательный процесс соотносится в мозге не только с нейронами, но также и с генами, ответственными за производство нейронов и нейротрансмиттеров. Она описала три типа систем мотивации у людей, которые направляют наше поведение, основанные на влечении или отторжении, угрозе или любви. Гормоны, такие как окситоцин, снижают возбуждение миндалевидного тела. И здесь встает вопрос, может ли сосредоточение на сострадании оказать такое же воздействие? Результаты исследований самой Тани Сингер пока свидетельствуют, что тренировка сострадания производит видимые изменения в цепях мозга и улучшает самочувствие. Геше Дадул Намгьял завершил богатый презентациями день, изложив буддийскую точку зрения на нейронауку и нейропластичность, которую он определил как способность мозга, нейронов, цепей и т.д. формировать новые структуры и принимать на себя новые функции. Он начал с того, что счастье – это не застывшее качество, которым вы либо обладаете, либо нет, но навык, которому можно научиться. Говоря о нейропластичности с точки зрения буддизма, он упомянул взаимозависимость тела и ума и высказал предположение, что тело и ум связаны друг с другом кармой. Среди прочего он также привел цитату, которую нашел в одном из буддийских трактатов, где перечислены восемь субстанций тела, и сделал неожиданный вывод, что мозг – это субстанция ума. Не уделяя много внимания мозгу, он говорил о сознании, которое по природе своей нематериально, светоносно и обладает способностью к познанию. Каждое «событие» сознания относится к сознанию, связанному с чувственным восприятием или с ментальным сознанием. Каждое из таких событий в отдельно взятый момент времени включает ум и ментальные факторы, базовое осознавание и вторичное осознавание. Он проиллюстрировал это яркими цветными диаграммами, на которых было представлено основное сознание, не окруженное, а скорее вбирающее в себя пять постоянно присутствующих ментальных факторов, фактор события, будь то сострадание или ненависть, и факторы добродетели и недобродетели. Он говорил о сложности процессов, происходящих в уме, с таким заразительным энтузиазмом, что когда он закончил свое выступление, то впервые за весь день по залу прокатилась волна восторженных аплодисментов.